But how to get to the office? Well, the vast majority of my colleagues in the same situation would jump into a taxi, but I prefer to ride. It’s my daily commute that keeps me sane. Well, sort of. So I found a place to hire bikes form in Hannover, which was conveniently located near both the station and my hotel, and borrowed one. 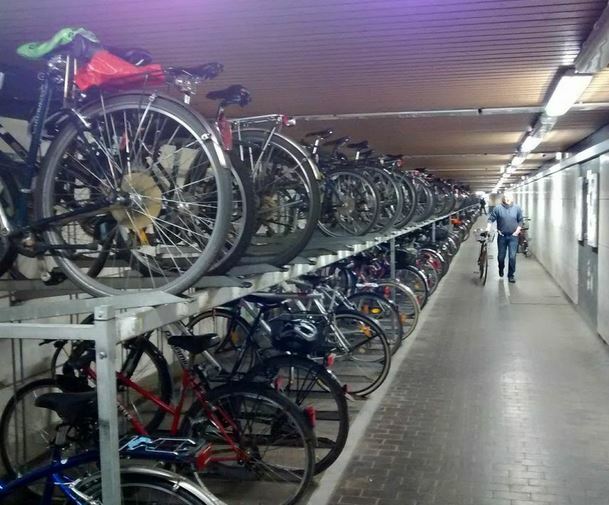 It was also a bike maintenance and parking garage, and it was a bustling place, with a steady steam of people bringing in and dropping off bikes. The offices are not in Hannover itself, but about twenty kilometers away, so I mostly got the train to the nearest station and rode the rest of the way (which, at less than two kilometers, wasn’t really far enough…!). There are a lot of people riding bikes in Hannover, and it’s all setup for it very well. Bike lanes and shared footpaths abound, the the burgers of that city all zip around. Everywhere you look there are untidy piles of parked bikes. I’m not sure if Hannover has more cyclists than is average for Germany, but it was fantastic to see. Also fantastic is the way motorists treat cyclists. As mentioned, there are quite a few bike lanes, but for the most part they are no Copenhagen-esque bike freeways. Often they are half the footpath, and sometimes weave back onto the road. But motorists are very aware of cyclists, invariably waiting well back from junctions to allow the bike traffic to cross before pulling up to the line, and giving cyclists plenty of room. 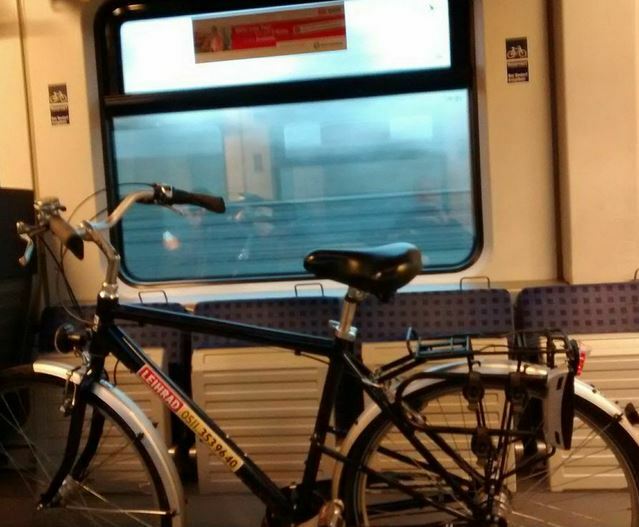 Taking the bike on the train was also a breeze, with a special carriage dedicated to bicycles. However, after taking the train for several days, I decided to ride the 20km back to Hannover one afternoon, to get a bit more exercise and see a bit more of the place. I checked the route, made plenty of notes and sketch maps and set off. And then the signs ran out. The path split three different ways, and there was no hint of which way to go. I had just passed under a main road, and could see a sign for Hannover on the road which headed to my left, so I took that direction. It was around this time that the bike, a sturdy city bike with a seven speed hub, started to fall apart. Evidently bumping down unsealed tracks for fifteen kilometers was not what the hire place had in mind, as bits started to fall off it; the most important of which was the back brake blocks. Given that the brake levers were connected up the reverse way round to ‘usual’, this meant that when I wanted to slow down and instinctively pulled the right brake lever, absolutely nothing happened. I continued somewhat cautiously, by now realising I was very lost. And then it started getting dark. What to do?